BainBridge strikes an ideal balance between suburban-living and city-life. Located in Northwest Meridian, new homes for sale in BainBridge are just around the corner from the bustling Ten Mile corridor with shopping, restaurants, entertainment, Heroes Park and a future Costco. Homeowners here enjoy tree-lined streetscapes which lend themselves to morning jogs and evening walks. Along with the community swimming pool, cabana and playground, you will find a beautiful green space which acts as the centerpiece of the BainBridge subdivision. With multiple builders, home buyers can choose from a wide selection of new, thoughtfully designed homes to find the perfect fit. Learn more about BainBridge real estate below. 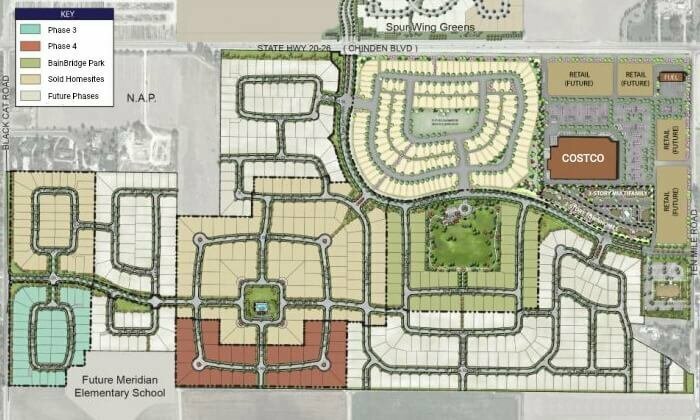 Explore all new subdivisions in Meridian Idaho and get to know the neighborhood on WeKnowBoise.com. 389 homesites ranging in size from 0.16 acres (6,970 Sq. Ft.) up to 0.39 acres (16,990 Sq. Ft.). To learn more about BainBridge homes for sale, call our experienced Meridian real estate agents at (208) 391-4466 or contact us online today.